Victims must be shown kindness, encouraged and rehabilitated !!! There’s nothing wrong with victims of any kind of abuse; they are perfectly normal. It is the ones that abuse others, who are not normal. It is they who have twisted minds and need to be corrected or counselled. 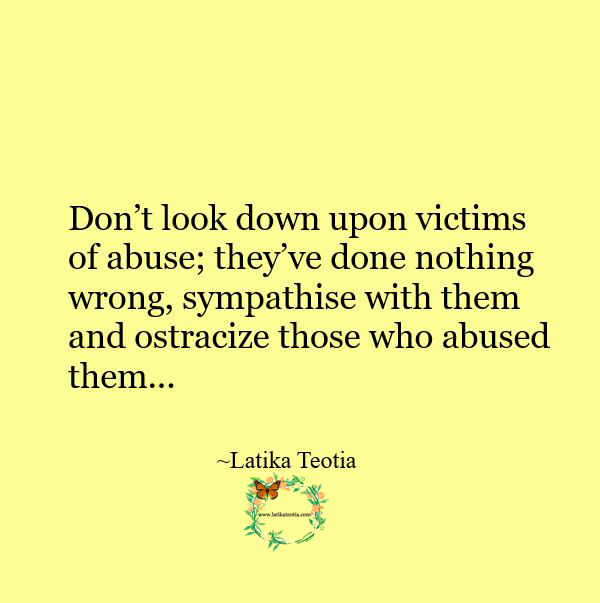 Unfortunately people look down upon the abused victims as if they’ve done something wrong and make them feel ashamed as well as guilty- which is not fair and absolutely incorrect. Victims must be shown kindness, encouraged and rehabilitated at the earliest and those who abused them must be ostracized. If you have been the victim of any kind of abuse, take down those walls of guilt, don’t hide behind dark doors, face the light and take charge of your life. Seek support- if required.